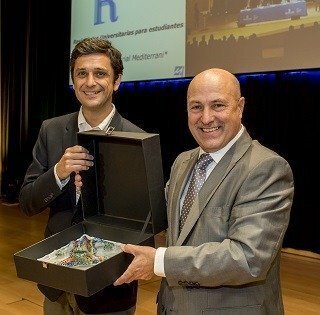 Eulogio Arza, General Manager of Mediterrani University School, delivered the “Entrepreneurial Award Mediterrani 2017” to RESA Accommodation company for its business excellence and cooperation with the academic community. This took place in the framework of the Inaugural ceremony of the 2017-18 course of the Mediterrani University School, center attached to the University de Girona, which was held on October 19, 2017. In front of more than 300 attendees. At the event, Mr. Carlos Cano, Commercial and Marketing Manager and representative of the company RESA, collected the award and during his speech, explained to the public the collaboration they have with Mediterrani, praising the 5 promotions of students who have worked in their establishments. Without a doubt a solid bet of future for the students of the University School Mediterrani.